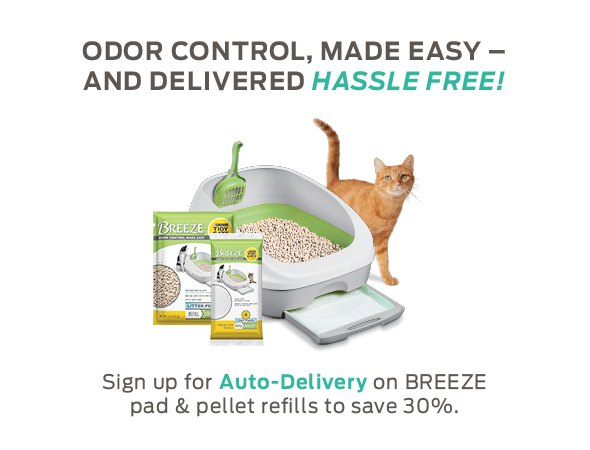 Each BREEZE Litter System (sold separately) uses these super-absorbent cat pads to absorb & control urine odor for one week for one cat. Liquids pass through the specially designed, cat-friendly litter pellets to the absorbent cat pad that sits in the tray below. Each pad is conveniently disposable, making cleanup easy. Also available in Original scent. Cat Pad Setup & Easy Maintenance: 1. Place one cat pad (soft side up) in the BREEZE Litter System drawer and slide into the base. 2. Drawer can be rotated 180 degrees, without touching the pad, to extend pad life. Store in a dry place.